How to Call the Dominican Republic from the U.S.
First dial 1 – the Dominican Republic country code. Then the area code – 3 digits (809, 829 or 849). Finally, the local phone number – 7 digits. Learn how to call the Dominican Republic from the U.S.
To call Dominican Republic, do you dial the 011 U.S. exit code required for international calls? Some international numbers have a plus sign (+) or exit code (011) you must enter before the country code. In this case, the Dominican Republic is part of the North American Numbering Plan (NANP), so it’s not necessary to dial the 011 exit code required for most international calls. Now you know HOW TO call the Dominican Republic, but what’s the BEST PLAN to call? Whether you’re calling relatives in Santiago or planning a trip to Santo Domingo, you’ll want a plan that covers landlines AND mobiles! Vonage World® is great, but only includes landlines, so you’ll need an upgrade that gives you calling to mobiles while not busting your budget! 100 included minutes to select Latin American countries not included in Vonage World – check out the Latin America 100 country list on our plan homepage. After the initial 100 minutes are used, great low rates to included countries thereafter. Vonage World Plus Latin America 100 gives you unlimited¹ calling to Dominican Republic landlines and 100 includes minutes to call mobiles – meaning you can call those you care for, no matter if they’re at home or on the go. It’s the most affordable and convenient plan Vonage offers when it comes to connecting to Latin America. And don’t forget about adding Vonage Extensions™ to your Vonage home phone service, as you’ll be able to extend your home calling plan to any phone, including mobiles – FOR FREE. So you can call the Dominican Republic from both home and mobile phones with the same plan! Get Vonage World Plus Latin America 100* today by calling 1-800-583-5421! Other than catching up, can my family in the Dominican benefit even more? When your family in Dominican Republic sign up for Vonage home phone service, we’ll use UPS to send them a Vonage Box™! What’s the big deal? This box allows for your family to make unlimited¹ international calls to the USA from both landlines and mobiles. The box accomplishes this by having a U.S. area code, letting you talk to your relatives as much as you want all at the price of a local call. Vonage Box™ = call Dominican Republic free*! Vonage seems to be ahead of the game. What about mobile apps? 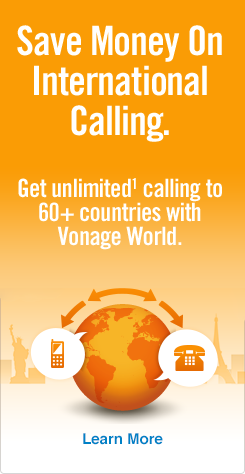 Take a peek at Vonage Mobile’s® Android™ & iPhone® international calling apps. It’s the most advanced way Vonage keeps you in touch.